Traditionally tatami mats were made of rice straw and used as a floor covering in Japanese homes. This is a guide about making a tatami wall hanging. Natural materials give your rooms a comfortable, casual feel that's in keeping with today's lifestyle. 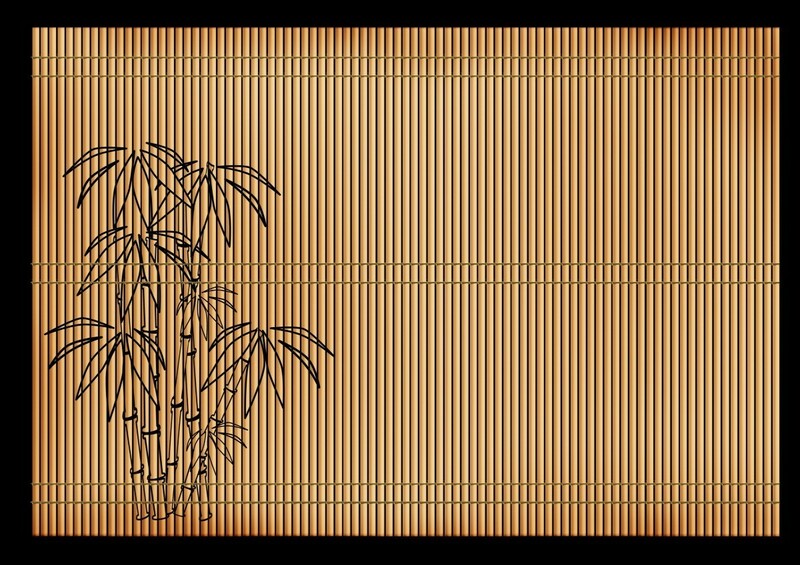 Bamboo and reeds have a long tradition in Oriental and Polynesian design. They're used to make floor mats, wall hangings, and screens. Often, they're decorated with brush painting in richly colored natural scenes or with carefully hand stroked Chinese or Japanese characters. Tatami mats have a great deal of importance in traditional Japanese households. They are used as floor coverings and sleeping mats, and are purported to have health benefits. The natural variation in the color of the reeds or bamboo that is used in making the mat can create beautiful patterns that form a subtle background to any painting. You can easily spend upwards of $50 for a set of six genuine imported tatami placemats, but they can be found far more inexpensively. If you shop my favorite boutique - the All for a Buck store - you can pick up a set of matchstick bamboo tatami placemats for a dollar apiece. At that price, you can make them a fun afternoon project with the kids, teach them a little about Japanese art - and not be the least bit upset if the end result isn't perfectly Oriental. Plan out your design. Remember that traditional Japanese designs are built around natural themes - flowers, mountains, birds, and other living creatures. Chinese screens often use the traditional themes like dragon and phoenix or the symbols for prosperity, longevity and luck. Sketch your design lightly on the mat with pencil. The mat pictured has a nature theme - four reeds for long life, a butterfly for happiness, and water for life. Using poster paints or inks and brushes, carefully fill in the outlines of your design, then the colors. 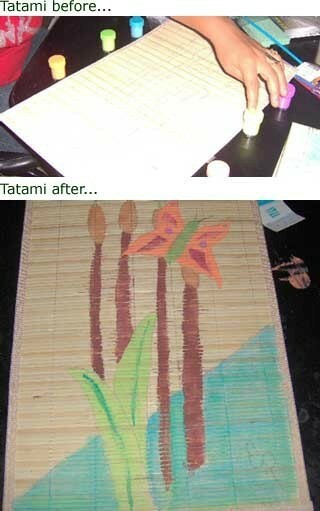 Remember that the bamboo will not absorb the colors as readily as the stitching. Let the painting dry flat. The picture hangers that I use for these are the one piece hangers that push into the back of a frame. Place one on either top edge on the back of the scroll, pressing it firmly into place. Thread silk cord through the eyes of the hangers and hang on the wall or doorway. To preserve the design on the mat, you can spray it lightly with an acrylic overcoat. It's very common for traditional wall scrolls to be decorated with ideographs for words. Prosperity, serenity, and happiness are popular ideographs. If you're making the wall scroll as a housewarming gift for a newly wedded couple, you can incorporate the Chinese symbol for Double Happiness, a traditional wedding design. Plum blossoms, cherry blossoms, dahlias, and lotus are traditional flowers that can be used for wall scrolls. 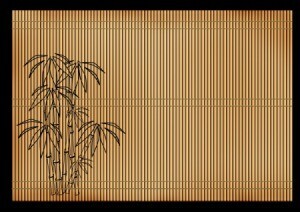 Bamboo and pine are both symbols for longevity.